Pretty Things: SIGN UPS for Bead Soup Blog Party are HERE!!!!! Please click here to learn the rules and how the party runs. Please be aware the participants will be picked at random. I will then make the pairings myself. Up to 200 people can participate. so please mark your calendars and come back!!! 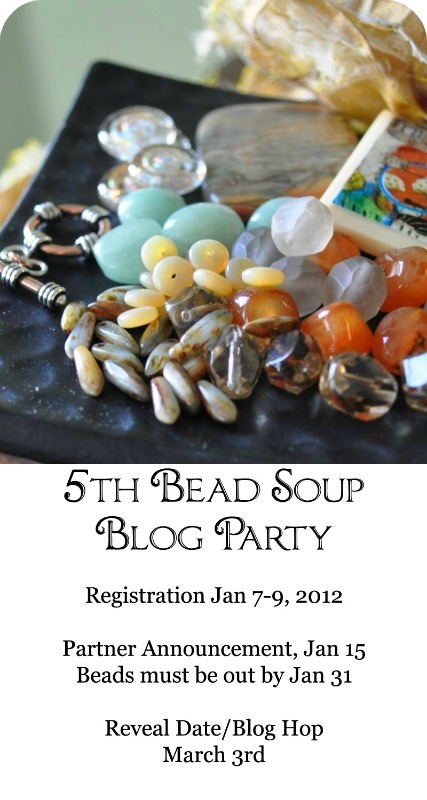 Just registered for the bead soup party. My first time participating. I'm excited and a bit nervous about it. Thank you! =) Hope the sign-ups go more smoothly for you. I am looking forward to some amazing soup this round! Thanks for organising this again Lori...my forms in and my everything's crossed. I'm so excited to be possibly participating in the 5th Bead Soup Party. Thanks again for hosting. Hope all is going well for you and your family. Thanks for doing this again Lori. I hope this one is a positive experience for you. I blogged about it too. The song from the Corus line not sure of the title is going through my head "I hope I get, oh I hope I get it... ", Have a great day Lori!!! I so want to sign up but won't be available during the hop. I've been trying to think of a way to do it anyway but it just wouldn't work. Have fun everybody! Whether or not chosen, I will still enjoy the journey. I really think the changes you have made are positive ones. Thanks again for organizing this major undertaking. I just registered! woohoo!! I'm so excited! Hoping and praying I get picked and it's a lot less stressful for you like this :) Thanks for organizing all of this Lori! I hope I get picked, to part of this great group. Lori you put on a fun well organized party. Soups ON! Just filled put my participation, ans was wondering if we get a notification email? Or not ? I didn't get anything, but would hate note being on the list. I wanted to thank you for making all this possible! You rock! Just put my name in the hat!! I am crossing my fingers and I hope that everything goes smoothly for you this round! I just signed in:) lets cross fingers:) I was allready part of bsbp last year an it was soooooo great to meet all this talented peoples. What a spiffy new form, Lori! Thank you for organizing another fun blog hop - looking forward to seeing many beautiful creations in March! I found the place to sign-up Thanks Hope I make the cut. Just want to thank you for all the hard work you do putting this P-A-R-T-Y on. Keeping my fingers crossed! Thanks again for organizing this Lori! Really hoping to be one of the participants! Wishing everyone best of luck and much creativity. My first bead soup... keep my fingers crossed! Yay!! Form submitted...either way, I'll have fun visiting all the blogs on "hop day" Thank you! Wow..I sure hope I get picked...I already got my soup planned out...hehehe. Im getting all excited all over again! But if I dont get the opportunity this time, I have some nice beads to play with..LOL Good luck to all. Thank you so much for creating these special events. You've done so much to support a community of beaders! No party poopers allowed. This sounds so exciting!! I just registered. Hope I am picked. Will be my first time. Wish me luck and good luck to everyone. Lori--I put my name in the hat early Jan. 7 and have sent out reminders on my blog the last 2 days. (Of course I bet you are doing just fine without my little reminders, thank you very much!) Ha! P.S. My fingers are crossed to get into the blog hop also. But only on one hand. If you cross on both hands, it negates the positive vibes. I learned that in grade school. Signed up yesterday. Just wanted to say that I thought the form was nice and easy to use. I did not know you could make forms like that in blogger. I need to learn more about the blog features! Just signed up! Thank you for your time and devotion to creating this awesome event. The beading community is very lucky to have this opportunity! Just signed up.. hopefully it went threw.. Excited about participating this time..
Wow, the time came up fast! I'm looking forward to the party! Hope the Party runs smoothly for you Lori! just registered for the bead soup party. would like to make sure that I can join that while my blog is on wordpress not blogger? Ohh - those spoons with the spices are divine! Can't wait to see who won in the lottery - I'm soooo looking forward to see all those creations in march. That blog-hopping with all the eye-candy is the best! Lori, thank you so much for doing it again. I have filled out my form and wait with anticipation the hope of joining the party, saw last years, looked AWESOME!